Share a workspace to allow other members of your team to view and edit data, and to collaborate with them within the workspace. Workspace members can be invited to join the workspace from the Members icon of the navigation panel. Existing workspace members, as well as those who have been invited, are listed on this screen. To add a member, click on "Invite Members". 2. Type in one or more email addresses and optionally a personal message that will be included in their workspace invitation email. Also, set the workspace access role. 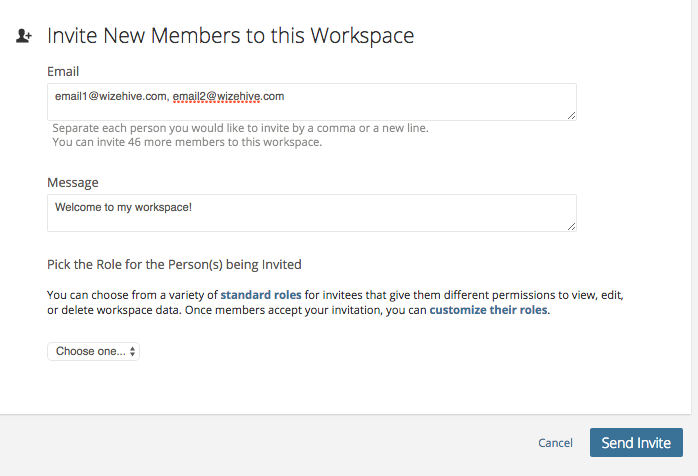 This role indicates the permission level that the invited member will have when they join the workspace. Learn more about workspace roles and permissions. 3. Click Send Invite. Once the invite is sent, the users will receive an email with a personalized workspace invitation URL. Existing users will be directed to log in to accept the invitation. New users will be prompted to create an account in order to accept the invitation. Sometimes, you may see the error message "This email address is already in use in this workspace", but you don't actually see someone with that email address in your workspace. The most likely explanation for this situation is that the email address you entered was linked to a user who was already invited to the workspace, but then accepted the invitation with a different email address. You invited "natalie@gmail.com" to the workspace. Natalie accepted the invitation, but her Zengine account is linked to her "natalie@yahoo.com" email address. If you try to invite the email address "natalie@gmail.com" again, you will get the error message listed above.